Salih Muslum, the former co-chair of PKK terrorist group's Syrian affiliate Democratic Union Party (PYD), has been detained Saturday in the Czech capital Prague, official Anadolu Agency reported Sunday. The Interpol unit in Czechia notified Turkish authorities that Muslum was detained in Prague on Feb. 24 upon Turkey's request and detention order. Czech authorities stated that a court will decide whether Muslum will be arrested, and the court decision will urgently be conveyed to their Turkish counterparts, asking Turkish authorities for necessary documents for his extradition to be handed over immediately. Turkish authorities from the Ministry of Justice and General Directorate of Security, who previously requested Czech authorities to detain Muslum after he was spotted, said they have started procedures for his extradition to Turkey. The detention came hours after Daily Sabah's sister publication Sabah newspaper reported Saturday that Muslum was spotted in Marriott Hotel in Prague, where he reportedly held two meetings. On Feb. 19, Muslum was seen attending a news conference in the Belgian capital Brussels, in which he accused Turkey of atrocities during Operation Olive Branch to clear PKK-affiliated People's Protection Forces (YPG) terrorists from northern Syria's Afrin. During his presentation, Muslum used photos from opposition-held Damascus suburb of eastern Ghouta, which has been besieged and attacked by Assad regime since the outbreak of Syrian civil war. It was not his first incident connected to the sharing of fake photos, as he retweeted a photograph in January on his Twitter page to defame Turkey by showing injured children with the message: "Turkey massacres in Afrin." However, it was later revealed that the photograph was a Sept. 14, 2014, picture from eastern Ghouta, then struggling under a crippling siege by the Assad regime. The photograph showed three children and a baby, who were injured after an air attack by regime forces in the Douma district of eastern Ghouta. He was then spotted in Switzerland's Geneva on Feb. 22, where he made a speech at the University of Geneva. Turkey had issued arrest warrants and subsequent red notices for Muslum and 47 other PKK high-rank figures in Nov. 2016, while a new red notice was issued for Muslim on Feb. 13 as he was included on the updated most wanted terrorists list with a four million Turkish lira ($1.05 million) bounty on his head. Born in 1951 in the northern Syrian town of Ayn al Arab, also known as Kobani, Muslum completed his studies at Istanbul Technical University. 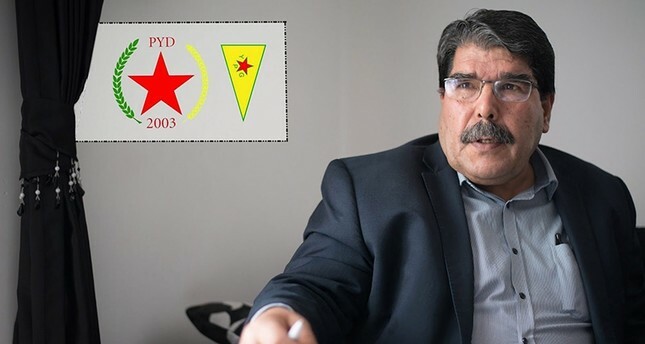 Initially a member of the Syrian affiliate of the Kurdistan Democratic Party, the ruling party of Iraq's Kurdish Regional Government (KRG) led by President Massoud Barzani, Muslum joined PKK's Syrian offshoot PYD in 2003 and served as its co-chair between 2010 and 2017. PKK is listed as a terrorist group by the U.S., the EU and NATO. In September 2017, he was replaced by Shahoz Hassan at the 7th congress of the PYD held in northern Syria. Unlike other leaders of PYD's parent organization PKK, which has waged a bloody terror campaign against Turkey since 1978 and leading to the deaths of more than 40,000 people, Muslum's inclusion into the terror list is relatively new. PYD was founded in 2003, at a time when PKK activities in Turkey were reduced to a minimum with its leader Abdullah Öcalan captured. PYD was ineffective in Syria due to tight regime control, but when the civil war broke out in 2011, it became a major player in predominantly-Kurdish northeast Syria. As the reconciliation with the PKK was ongoing between 2012 and 2015, Turkish government tried to persuade PYD to drop its hostile attitude towards Turkey, open cooperation channels and end its cooperation with the Assad regime. As PKK unilaterally resumed armed attacks in July 2015, the PYD and its armed wing People's Protection Units (YPG) provided PKK with militants, explosives, arms and ammunition. Simultaneous armed revolts broke out in almost all towns and cities bordering Syria, whereas terrorists trained in northern Syria staged suicide attacks in Turkish cities. In addition to attacks targeting Turkey, the PYD and the YPG have been accused of attacks targeting civilians and political opponents in areas they control in northern Syria, as well as changing demographic structure by forcing local Arab and Turkmen groups out of their land and villages. Speaking on the issue, EU Affairs Minister Ömer Çelik said that Turkey is ready to fight against anyone who threatens its existence, regardless of the terrorist organization that he or she leads. Çelik further expressed that for years Turkey has warned these people to give up on their bad intentions against the country since Turkey would not step back no matter what. "The ones who paid attention to our warnings and the ones who gave up on their intentional actions against Turkey did not see any harm from us. Yet, the ones who acted against Turkey tried to harm its stability and power, came across a strong Turkey," he stated while adding that Turkey has the ability to fight against its enemies all around the world.